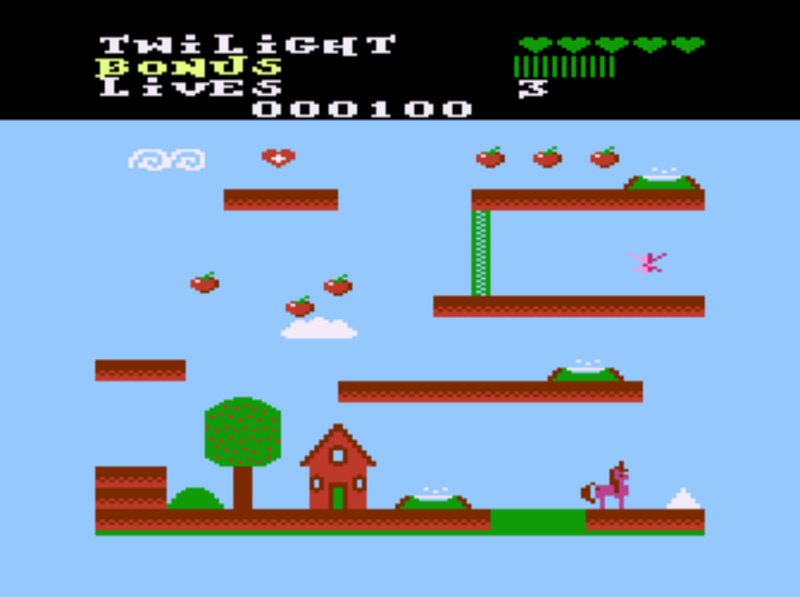 An Atari 8-bit port of the flashgame "Adventure Ponies" from the Hub network. Use the joystick to control any of the mane characters as you navigate the various levels to collect the elements of harmony, and to defeat your foes. Requires 64K - Hold the "OPTION" key when booting to disable BASIC. In Altirra you can disable BASIC by System -> Firmware -> uncheck "BASIC (boot without Option key)"
This is a WIP and still being tested and optimized. * I wrote this in C in CC65, and have been slowly rewriting parts of it in Assembly Language for optimization. The gameloop that controls most of the game logic is still written in C. I plan on rewriting that in assembly for the final optimization, but it is pretty daunting. Edited by Gibstov, Fri Apr 5, 2019 5:29 AM. Edited by _The Doctor__, Sat Mar 30, 2019 9:55 AM. Nice game so far. Thanks for sharing. A suggestion about the control scheme: using down to fire while moving is a bit frustrating. If you can switch shoot laser to be the <button> and teleport to be <down>, I think it would be better. I originally considered using the button for shooting, and down for the special ability. But since this is a port of an existing game, I decided to keep the controls the same as the original game. Edited by Gibstov, Sat Mar 30, 2019 10:34 AM. Edited by _The Doctor__, Sat Mar 30, 2019 10:54 AM. OK. How about offering it as an alternate control scheme? The original does allow for the <S> key (along with <A>, <W>, <D> for directionals) to be used, rather than <down>. BTW, you know you have another color available to you in Antic 4? It is being used by the combined Missile color that makes up the mane/tail of the pony. It changes color as she moves vertically. OK, I see; but it's a big sacrifice to lose one color for the whole display. You could still use your combined missiles and find some medium ground with the playfield. I came up with this. I really don't think it sacrifices much for the looks of the pony. The 4th/5th color would need to be dark brown & white, in this case. That does look a lot nicer, however it won't work with Rainbow Dash, or any of the other ponies as their manes are all different colors. I guess I'd be satisfied just to have the ponies change colors; but everybody has their own design concerns. Edited by MrFish, Sat Mar 30, 2019 8:13 PM. We were enjoying it as is though. Edited by _The Doctor__, Sat Mar 30, 2019 9:35 PM. Thanks. There are also some other things I do with the missiles that kind of require a change in color too. For instance Pinkie's party canon, or AJs hat. Awesome, thanks. One idea that I did have, but its kind of a bridge to far now, is where you switch fonts every VBI and use dithering to gain extra colors. (The name of this method escapes me at the moment). However, I am completely out of memory right now. Cool game. I also like the diferent level-bosses and their animations. I added an ATR image with the game to the original post for anyone who has trouble using the XEX file on real hardware.